I am totally smitten with this card. I may have to make quite a few more and send them out for easter. Want to know a secret? Those "eggs" are actually one of the tree tops from Funky Foliage! Now how is that for versatility? I played with this set quite a bit this weekend, so there will be more to come over the next couple of days. In the meantime, hope you enjoy the rest of your weekend. You know what the best feeling in the world is? OK maybe not the best...I mean your wedding day, holding your baby for the fist time, ok, ok. But it sure does come close. 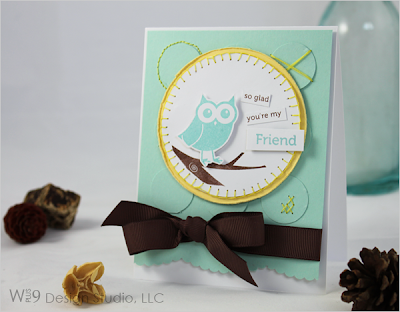 Blog hopping and seeing your designs showcased in gorgeous designs! It makes me so happy and provides a little high that lasts for days. Seriously. So as I was perusing all of your fabulous creations and talent, I spied some drop-dead gorgeous, to-die-for creations featuring Funky Foliage by Paulina at Pretty Pink Posh. Oh and she shares my obsession with pink, oh be still my heart! 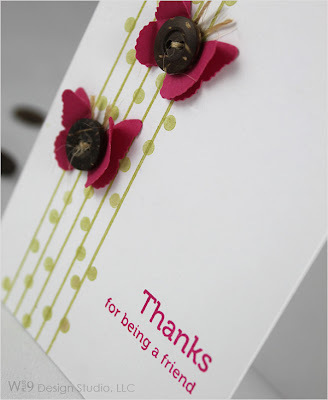 Check out these gorgeous cards that show off Funky Foliage in the most flattering way, no shortage of detail here! I just adore the bling and buttons she's used to dress up the middle of the trees. And be sure to visit her blog to see more Funky Foliage, as well as all of her other stunning creations. Thanks for making my day Paulina! If you've visited the Studio you may have noticed the Color Cue banner. Color Cue will replace the previous Inspire Me Challenges. I will post a new color combo monthly, both at the Studio and here on the blog to help get those creative juices flowing. This Color Cue will close on Tuesday, March 16th at 11:59 pm EST. As always, have fun, I can't wait to see what you create! For your convenience, we have added the Paypal Express Checkout option to the checkout process at the Studio. If you encounter any issues, please contact me using the customer service link on the site. When I saw this challenge, I just knew I wanted to play along. And luckily I made some time this weekend to get inky! Cath over at Moxie Fab World, challenged us to have fun with floss, and oh how much fun could be had...but alas, I only had blue floss on hand (must remedy that this week). So I pulled out the SU! Nursery Necessities stamp set, and decided to do a baby boy card. This is what I came up with. I drew in some waves and came in with a backstitch using blue floss. Tip: I pre-pierce the holes with my needle and then come back in and stitch. Amongst those waves I nestled a little sail boat. I finished it off with a bow and a tag. 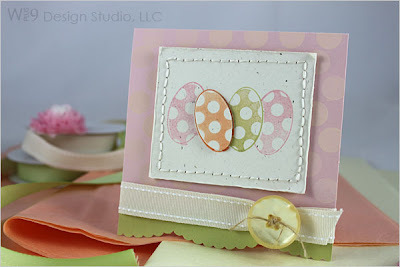 Super simple card, but it sure does look like it took much more effort than it did! Love it when it turns out that way. ;o) Here's a close up of those little waves. Thanks for stopping by today and I hope your week is off to a good start! I have another project to share with you that I was able to sneak in the other night. I'm really loving this set, Funky Flowers, more and more everyday. (Am I allowed to love my own set that much...or is that bad?) I haven't even scratched the surface of what it can do. Here I've used the lines from Just a Note stamp set and the circle used for the center of flowers from the Funky Flowers stamp set to create a neat little background element for my butterflies. The color combo, Melon Mambo (SU! ), Spring Moss (PTI), brown and white, is one of my favorite. I don't know what I'm going to do when I can't get my hands on that Melon Mambo anymore! The sentiments are also from Funky Flowers. You can see more from this set here, here, and here. Thanks for stopping by today, I'm so looking forward to the weekend! Well I was finally able to break away from the computer to get my stamp on...and man was it fantastic! LOL It had been a whole week since I had gotten any ink on my hands and it was time. So I headed over to Embellish Magazine to see what the latest challenge was and if I was in time to participate. And I was in luck. A birthday challenge using the colors pink, blue, green and brown. Admittedly, not my usual color combo, but hey, there is pink...so you know I'm there. I pulled out Funky Flowers and the next thing you know, I was done! 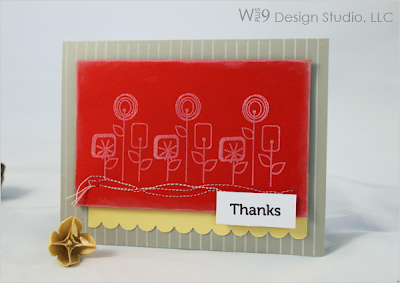 I used one of the flower tops and stamped repeatedly to create the bold geometric background. The bold pattern really compliments this bold color challenge well. 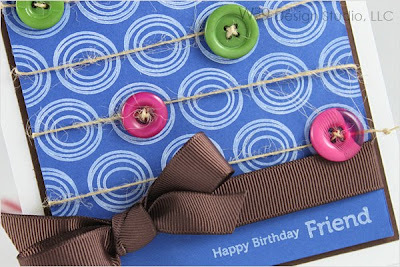 I added some buttons threaded with twine to break it up a little and used the "Happy Birthday" and "Friend" sentiments from the same set. Great news for those of you who have placed orders, I'm getting delivery confirmations already! So look for your sets to be arriving over the next couple of days. I can't wait to see what you guys create! Hope you enjoy and are having a great week! White, PTI; Chocolate Chip, Brilliant Blue, SU! The wait is over, The Studio is now open! All of our debut stamps are available for purchase. Check out the store at www.wplus9.com, and if you encounter any problems, have any requests, or questions in general...PLEASE let me know. I am personally responding to all questions and suggestions and appreciate the feedback! Thank you so much for taking the time to stop by today and I hope you all have a fabulous Valentine's Day. I believe we are going out for Thai...yum, my favorite! The time has come to debut the very first release of Wplus9 Design Studio in full. If not, I will also be posting here on the blog as soon as the stamps are ready for purchase. I bet you thought I'd forgotten, but I didn't, just got busy. There were a lot of gorgeous "trash salvages" entered in the Inspire Me Challenge #5: one man's trash. But I've chosen three that really stood out to me. 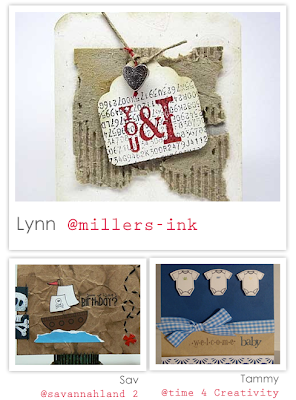 Look at how Lynn Miller used a piece of a card board box! I'd take that gorgeous creation any day! Next up I fell in love when I saw Savannah's rescued paper bag. A brown paper bag is about as close as you can get to Kraft without being Kraft...and I'm a sucker for the needle-point on cards lately, so all around this one caught my eye. And...the random number generated for the Stampin' Up! Prize Pack was......#3. Lynn Miller! Contact me Lynn for your prize. I have some other things I need to get in the mail as well, so if you are waiting on something from me, it is coming. And finally, don't forget to check out what the design team has been doing with the Wplus9 Design Studio stamp sets lately if you haven't already seen. Maile has worked her usual magic with Funky Flowers and I couldn't believe my eyes when I saw her sample from Just a Note. It also happens to be my hubby's fav so far. Savitri has stolen my heart with her use of Funky Flowers, seriously a must see! 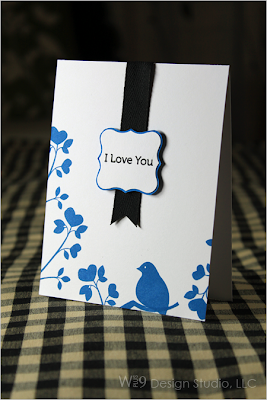 Kerrianne has some gorgeous creations using Love Birds. I love what she did with a branch and some bling; breathtaking! It is time to unveil the final set in Wplus9's debut release. This set is the largest in the release, containing a total of 31 stamps! 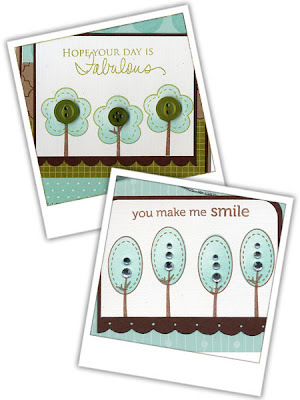 Like "Funky Foliage" this set is a true image building stamp set with endless possibilities. I am pleased to introduce "Funky Flowers". Funky Flowers contains 31 stamps; 18 building images, and 13 sentiments. For my first card I wanted to really showcase these flowers' "funk" by taking it old school and using vibrant colors that say "look at me"! Wowza! Isn't that fun? 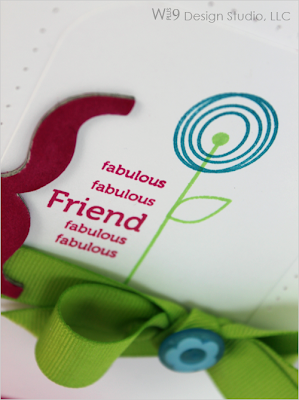 I used 4 of the image building stamps to create the flower and two of the sentiment stamps to create the "Fabulous Friend". Here's a close up on the crispy images these stamps produce. But don't let the "funky" fool you. This set can go soft and dreamy as well. For my next sample I used the owl image that comes with "Funky Flowers" and paired it with the branch from "Love Birds" and some hand-stitching. The result: just dreamy! I used some masking to get the branch just where I wanted it and went all the way around the inner cirlce with a blanket stitch. I popped the owl on some dimensionals and added my sentiment. For the background I added some random hand-stiching around and in the punched cirlces to keep with the softness of the card. And finally, can this set go a little rustic, a little vintage? Why it sure can! Change out the color pallete, add some stripes in white on sand, and a little machine stiching, and you've got it. I used the lines from "Just a Note" to create the background pattern of stripes. 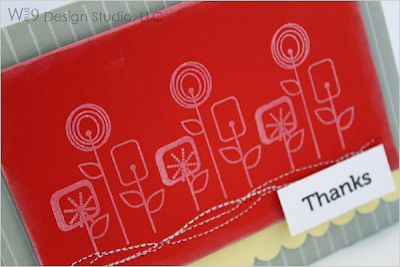 For the focal point I used 1 image, a pre-built collage of flowers for quick stamping, repeatedly across the front. A little embossing, some stitching, and a sentiment. Yum! Here's a close up of that focal image. All of those completely different styles out of ONE set! I'd say that's versatile. And do you want to see one more? 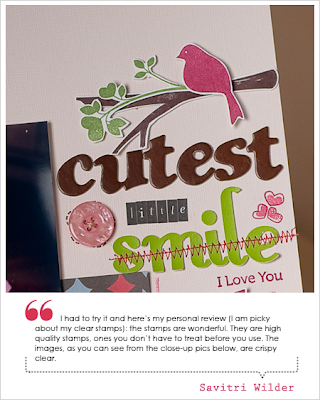 Hope on over to Maile Belles' blog to see how she used some of the images to create patterned paper. You do not want to miss it! All sets will be available next week. Keep checking back for the exact date or subscribe at Wplus9.com an you will be notified by email as soon as The Studio opens. I will post all full preview of all sets and the Design Team will be creating more projects until then. Thanks so much for riding along with me and excusing the little bumps along the way. Once we get this one under our belts, it will be a smooth ride from there. Good Morning All! I hope you are enjoying the debut release previews as much as I am. I wanted to interrupt and take this opportunity to give you a few updates and details. The big question is "When will the store open?". Though I can not give you an exact date just yet, we are close, very close. Within the next week close! We are currently getting the payment processing tested. We want to make sure that your shopping experience is as enjoyable, secure, and glitch-free as possible. So you can look forward to an easy to navigate site, gorgeous graphics, well tagged and organized products, with a seamless checkout, all without ever leaving the store! "Will your stamps be available in Canada, Internationally?" Initially our products will only be available in the US and Canada. However,it is my goal to make our products available Internationally. I will provide updates on our availability as I get them. "Will you be offering more than just stamps?" This is entirely up to you. I would LOVE (and have manufacturers lined up)to expand the line into a total coordinating suite of products at an affordable price. 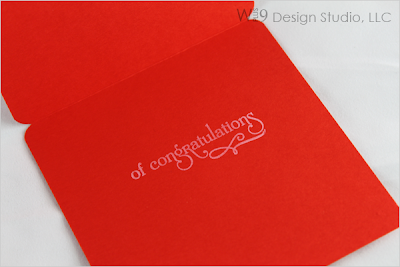 If the stamps are successful, you can look forward to much much more from Wplus9! "Do you have an Angel Policy?" We will have an Angel Policy and the details will be posted on our website Wplus9.com when the studio opens. I love hearing from you, so if you have any other questions, please leave a comment and I will be sure to answer them. The ladies have been having a blast playing with the stamps and will have more projects to share with you over the next few days. Kerrianne and Maile will be sharing what they have been working on tomorrow and Sunday. You don't want to miss it! We have seen 3 of the 4 sets so far, Love Birds, Funky Foliage, and Just a Note. Do you have a favorite so far? Well, save some room, because I will be unveiling the final set for this release tomorrow. See you then! It's time for a look at the third stamp set in the Wplus9 Design Studio's debut release! I am excited about this set because I haven't run across many of it's kind and certainly not one this robust. They may be out there, but I haven't seen them. So I am very excited to share Just a Note with you. This set was purposely made a little larger in scale and is perfect for adding to your scrapbook pages. Just a Note contains 20 stamps; 13 images, and 7 sentiments. When I started designing this set, I quickly realized it had such an elegant feel. 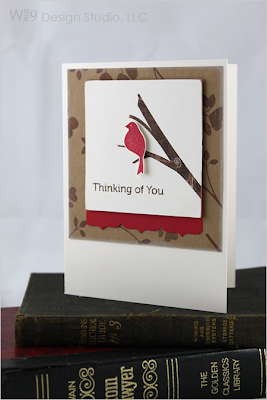 This first card, a 5x5 square, embodies that feeling to a "T", using one sentiment and just one image. I just loved the swirls in that paper so much, I had to accentuate them by adding some pearls. The simple layout helps to balance all of the movement and visual interest the paper brings. And check out that font! It's as if it was created just for this set. Don't let the elegance fool you, this set can be fun too. 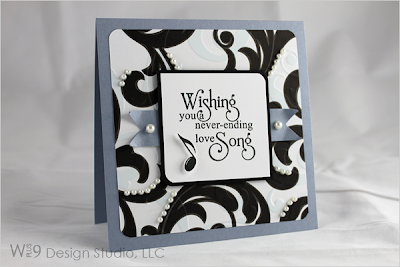 In my next card I was so inspired by Maile's card that I just couldn't wait to CASE it (I love my design team!)! And finally, I decided to show how easy it is to create those quick all purpose notes (no pun intended) in bulk to keep on hand when you need a little something fast (these would have come in handy for me the other night). Here I kept it very simple by cutting 4x4 cards in a couple of different colors. I then arranged the notes on my acrylic block vertically and inked them up. Now all I had to do was stamp the left side of each card base. 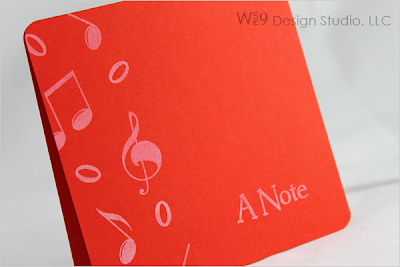 The "A Note" sentiment in the corner finishes off the front. Now all I had to do was stamp the insides with a different sentiment for each. A quick set of "notes" ready whenever I need them. Or even a great gift for a friend. I can't not express how much all of your comments and support mean to me. I love reading the comments in the morning...at work...in the car...while bathing the kids, you get the point. ;o) So thanks again, so much! I am having so much fun sharing the sets with you. The Design Team is hard at work putting together samples to share with you all. And today I would like to share a not so little something from Savitri. She has put together a stunning, fun, and colorful scrapbook page using bits and pieces of the three sets we have preview so far: Love Birds, Funky Foliage, and Just a Note. Be sure to stop by and leave her a comment! We are down to the last preview...any guesses on what it may be? Are you ready for the next set? This one just may be my favorite of the 4 debut sets. Funky Foliage is a true image building set, there are so many possibilities. 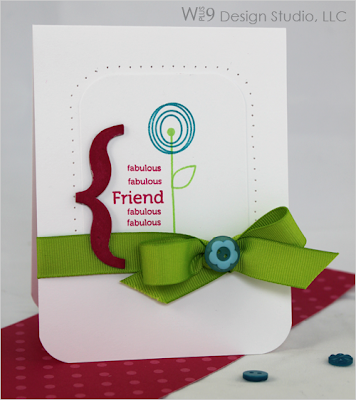 Funky Foliage contains 24 stamps; 18 images and six sentiments. 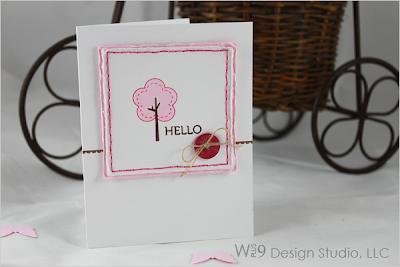 For my fist card I used one of the tree tops, the matching outline image, and the matching faux stitching inset. Yep, there are matching insets to create the perfect faux stitching! 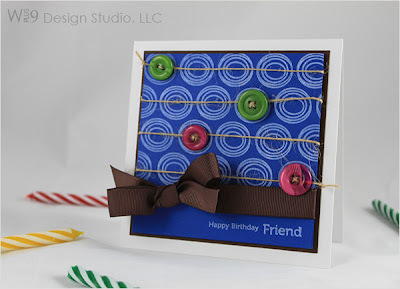 *Note: the background scallop stamp on the card base is from PTI's faux ribbon set. I added some hand stitching around the focal panel and finished it off with a button. 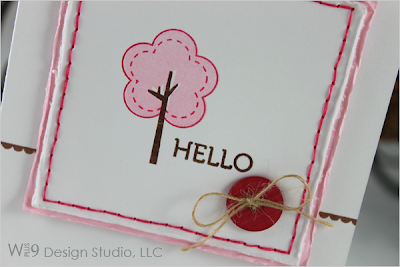 The "Hello" sentiment is also included in the set. I'm a sucker for simple serif typefaces. My next sample showcases a couple more tree styles as well as their matching outlines. The great thing about these trees is that you don't have to use the whole tree...even cropped, they make the cutest embellishments. Here I stamped three of them and then used SU! 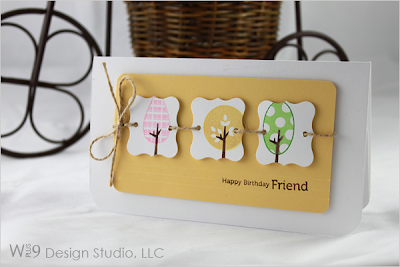 's curly label punch to create three panels. I strung them all together by punching a hole on the left and right sides of each panel and threaded them with a heavy twine. The sentiment on this card is from another set that you'll see later this week. 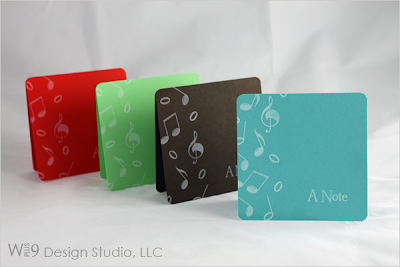 *Bonus: This card is a money holder, you can find the tempate for cutting and scoring dimensions here. 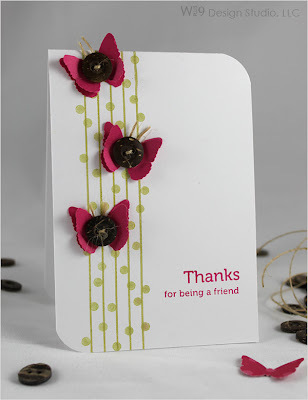 And finally I have a card that features just sentiments. 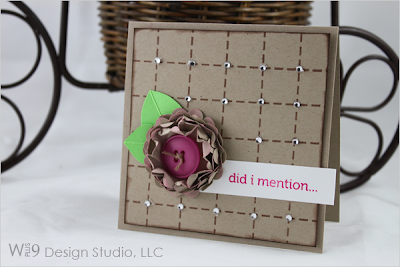 *Note: the background grid stamp on the card base is from PTI's faux ribbon set. "did i mention..." I just love that phrase, it could be the start of any occassion, which makes it a perfect staple sentiment. Oh and I just had to try out that poofy flower thing that I've seen all over blogland lately. Love it...but I want to try it with tissue paper, I think I will like that even more. 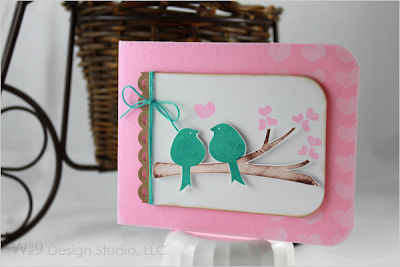 I finished the inside using another sentiment from Funky Foliage and some hearts from yesterday's set "Love Birds". So that's it for today, I really hope you are enjoying the release sneak peeks so far. Are you excited? Is there something you've seen so far that is your favorite? There are still two sets left in my debut release, and you don't want to miss them...I promise! Wow, that's all I can say...wow! I just have to tell you all how much I appreciate the kind words, emails, and the support in general you have shown. Over the next few days I will be posting previews of the debut release at Wplus9 Design Studio. So here it goes and I hope you like it. Love Birds contains a total of 22 stamps; 16 images and 6 sentiments. This first card is a great masculine card. I used one of the heart flower images to create a gorgeous tone on tone background. For the focal point I used one of the six bird images and popped him with dimensionals on one of the two branches in the set. I intentionally inked the branch unevenly to give it a nice natural textured look. This next card I am absolutely in LOVE with. Here I used the same flower image and paired it with a larger bird and another branch. I kept it super simple, I mean, come on, isn't that color combo powerful?! I added a bit of black twill, looped it over the top of the card and stitched it on the back to hold it in place. This final card is just so sweet. I used yet another bird image available in the set. Again I unevenly inked the branch, with two shades of brown this time to get that natural texture. I finished it off with a couple of different heart images that are also included in the set. 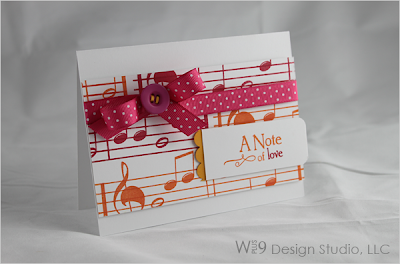 The inside of the card is finished off with the same hearts from the cover and another sentiment. 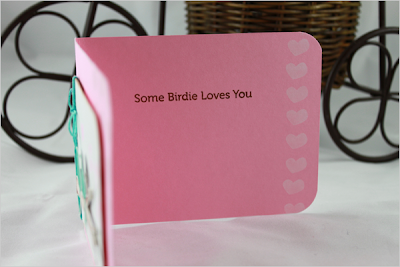 Want to be notified as soon as Love Birds is available? Head over to Wplus9.com to subscribe. So, what do you think?